Full crates and mixed crates are a great beer-gift for yourself or any other Belgian beer-fan. Visit Belgiuminabox ” beer by the crate shop ” to find your favorite beers in store. 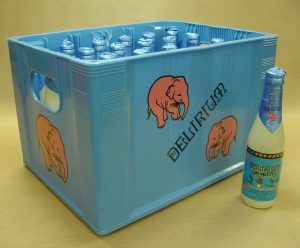 Buying beer by the crate at Belgiuminabox is easy for storage, secure to ship and saves money. Leo Imai – the master brewer and founder of OWA Brewery brought some of his brews to our warehouse. 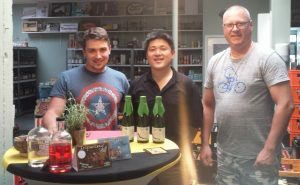 Japanese national Leo Imai lives and works out of Brussels where he usues Japanese ingredients to make his beers like Stout, Grand Cru and different style Lambics and Fruit Lambics. 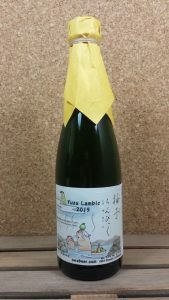 Fruit Lambics like lemon peal , cherry leaves, cherry blossom or Japanese plum. 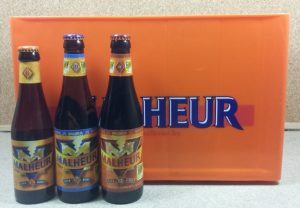 Belgiuminabox.com is the webstore for buying Belgian beers, alcohols, glassware and merchandising. Apart from a beerstore that sells individual brews by the bottle in 25 cl, 33 cl, 75 cl and oversized bottlings, Belgiuminabox has a seperate beer-category that has all Belgian beers available in ” full crate ” and ” mixed crate ” including the brewery crate (case). 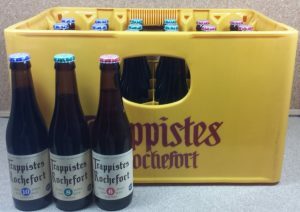 Belgian beer enthousiasts are looking for the real Belgian experience by having the original beer available in it’s own brewery crate just like regular Belgians are having that convenience. 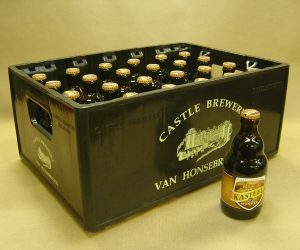 Buying ” mixed crates ” mean that all brews from the brewery are available in the crate per 4-6-8 bottles but totalling a full crate of 20-24 bottles (depending on the line of beers made by the brewery). Go to the ” beer ” or to ” beer by the crate ” to look up the shop’s crates. Wieze Tripel is a top-fermented Belgian beer, re-fermented in the bottle. 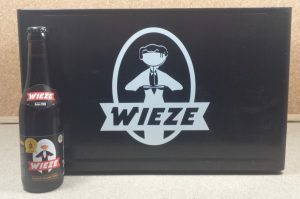 It is brewed according to a unique recipe as a tribute to the heritage and tradition of the Van Roy Brewery from Wieze. It is a beer with a subtle spicy taste, complex hop aroma and a slightly bitter aftertaste. Serve chilled in a spherical Wieze glass ! 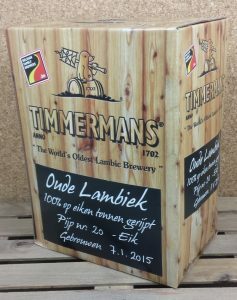 Belgiuminabox.com has a fresh supply of Timmermans Oude Lambic bag-in-box 5 L and limited available till supply lasts. Westvleteren 12 (Abt) of St Sixtus Abbey in Westvleteren is probably the best known Trappist. For many years in a row, Westvleteren 12 (Abt) was elected and has won many awards in Belgium and abroad for best beer. 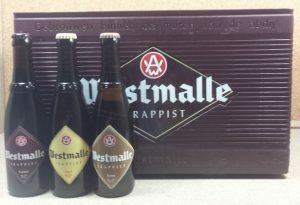 Belgiuminabox.com have all the Westvleteren brews in the shop’s inventory. Here we offer Westvleteren 12 in mixed crates of different bottling years (2014-2015-2016). The trappist beer evolves in flavour over the years and the Westvleteren 12 acquires a more rounder and deeper taste as the brew grows older. 8 bottles of each bottling year totalling into a full wooden Westvleteren crate of 24 bottles. 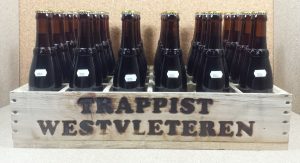 This selection of Westvleteren 12 bottlings and the wooden crate make a perfect beer-gift for any Belgian Trappist-fan !